Riding at moderate speed burns over 500 calories per hour. 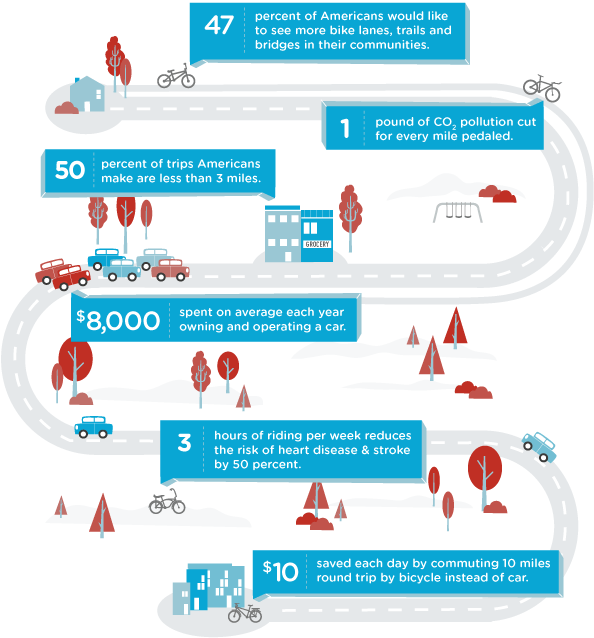 The average person loses 13 pounds in their first year of commuting via bicycle. Most car trips in the US are shorter than 3 miles. That may be less than 15 minutes on a bike! 60% of all pollution created by cars happen in the first few minutes, before pollution control devices kick in. Because it is fun! Remember biking as a child? Well, if you have forgotten what that is like, stick a baseball card in your spokes, and hit the road! Just be sure you stay in the bike lane! What are your thoughts about bike lanes? Should cities make bike safety a priority?